This one goes out to all of you new kids on the block. I spent the first couple of years playing the guitar with poor technique. I know many young kids starting out do that because all they want is to dazzle their friends with Crazy Train or Eruption, or even Enter Sandman. Many kids focus strictly on tabs and learning the latest cool riffs, or classic licks. The problem is that when you learn poor technique, and play that way for a long time you get really comfortable with it. This means when you actually become enlightened to the importance of technique, you not only have to learn a new technique, but also unlearn your bad habits. This takes a lot of unnecessary time and effort. You see, had these young kids learned the proper technique first, they would have actually learned all of those cool licks faster, and played them a lot better, without spending hours practicing. What I’m saying is, that technique is important, and if you’re taking lessons and your teacher tells you to hold the pick a certain way, do it. The teacher is telling you this for a reason. The reason is that proper technique actually makes things far more easier. It may sound like your teacher wants you to endlessly practice scales, but the truth is that when you learn things like proper technique it makes all the other stuff come that much easier, and that way you can get the practicing out of the way and get into playing. I know holding a pick a certain way, or alternate and economy picking may seem unnatural at first, (at least it did for me) once you’ve gotten used to it, it is even more comfortable. 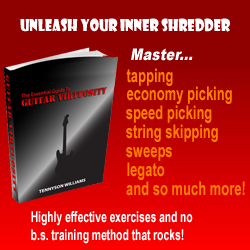 Guitarists use these techniques because they actually relieve strain and help play better without hurting yourself. I’m not going to get into detail about all of the proper techniques because I think the other people writing these lessons have already a great job at doing so. So the last point I’ll leave you with is this: My advice is to take all the advice you get, try it out and work with it. Chances are that it will make you much better, and even if it doesn’t work for you, the process of learning something and trying to apply it is good exercise for the mind and will not only help you as a musician but also a person.